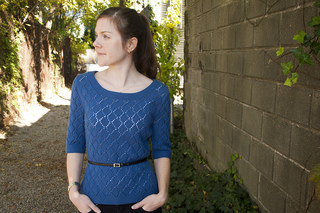 Gussie – a lace knit with gentle shaping and three-quarter length sleeves is a perfect multi-season outfit topper! Dress it up or down with layering. 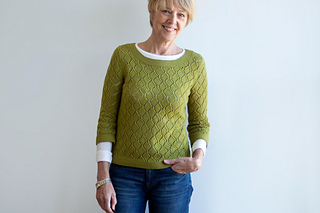 Wide garter stitch bands trim its scoop neckline and hems, and balance the active diagonal of its lace – a 10 stitch by 16 row repeat that is meditative and easily mastered. 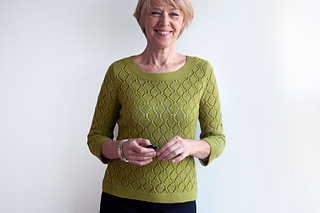 Pieces are knit flat, bottom up, with seaming. Enjoy! Shown in Chickadee wool by Quince & Co. (100% wool; 181 yds per 50g skein); color – River or Bosc; 6, 7, 7, 8, 9, 10, 11 skeins, or for comparable yarn, approximately 990, 1130, 1260, 1400, 1545, 1700, 1825 yards / 905, 1035, 1155, 1280, 1415, 1555, 1670 m.
Long-tail CO, decreasing (skp, sk2p, ssk, k2tog), increasing (m1R, m1L, yo), 3-needle BO, short row shaping, setting in sleeve caps, stitch pick-up around neckline, blocking and seaming. 14 page PDF includes pattern instructions, photographs, schematics, lace descriptions and charts with tips on making lace modifications at shaping points, row tracking grids for managing at-the-same-time instructions, and definitions for relevant abbreviations.